The Jeep Wayout takes advantage of the all-new Gladiator’s class-leading payload and showcases a full roof-top tent and custom, large sprawling canopy. 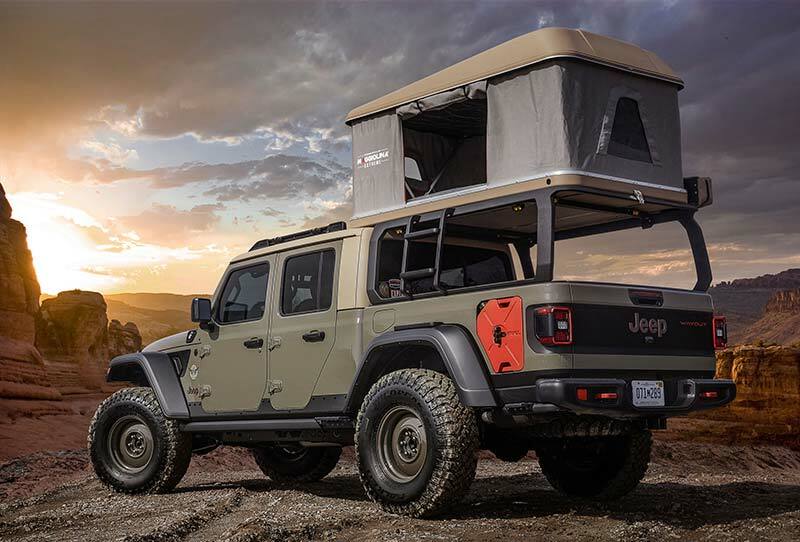 The body armoured exterior of the Wayout features a new Gator Green colour that will be available on production Gladiator models and also boasts a custom bed rack with an integrated ladder to the roof-top tent and amber LED task lighting on the 270-degree awning. 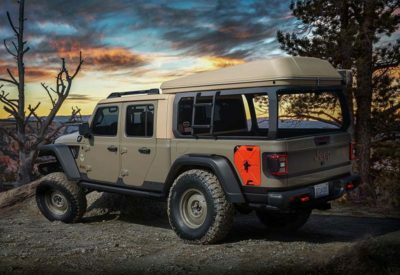 For even more convenience, the Wayout features two custom-fit auxiliary fuel tanks integrated into the bedsides as well as an ARB on-board air system with a body-mounted quick-disconnect air supply line. 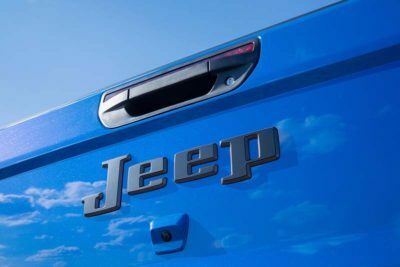 To enhance capability, a Jeep Performance Parts two-inch lift kit increases ground clearance while the 17-in. steel wheels wrapped in 37-in. 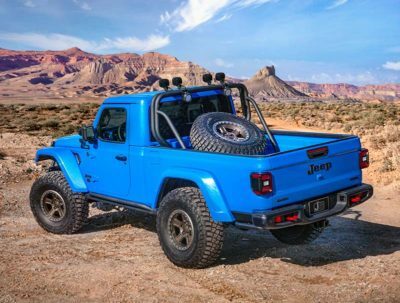 mud-terrain tires provide a distinct retro feeling. 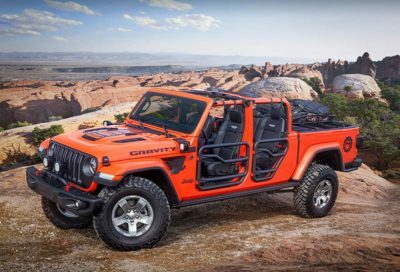 Finally, the concept vehicle is powered by the 3.6L Pentastar V6 engine that is mated to an 8-speed automatic transmission. 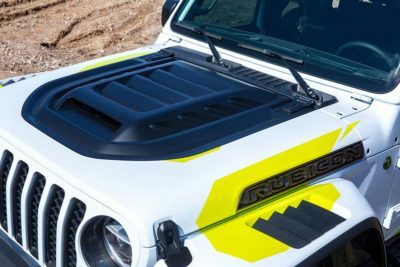 The Jeep Flatbill is also based off of the all-new Gladiator and features an exterior design inspired by Motocross culture featuring a vented carbon hood, high-clearance flares and a custom-designed shortened front bumper and skid plate. 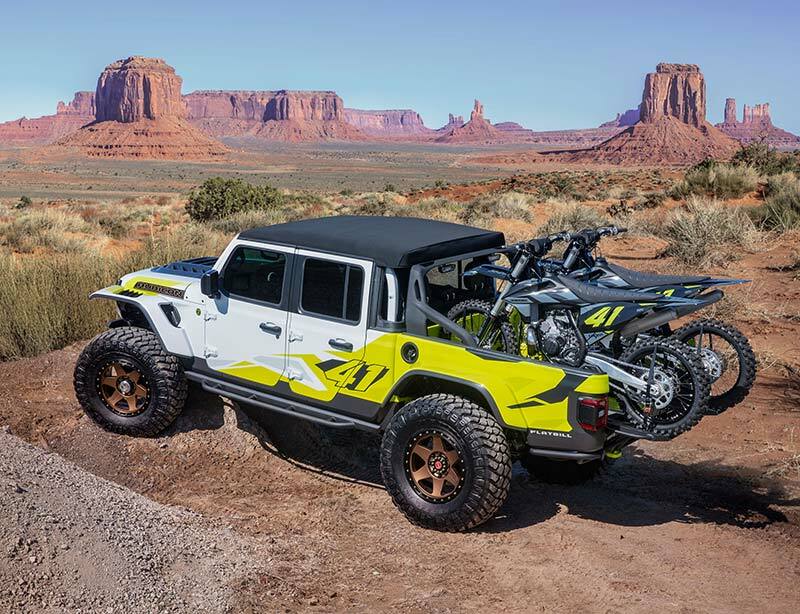 The truck’s bed is fitted with a pair of dirt bikes and allows for the removal of the tailgate to utilize dedicated wheel ramps that have been installed and slide out for easy access and loading. 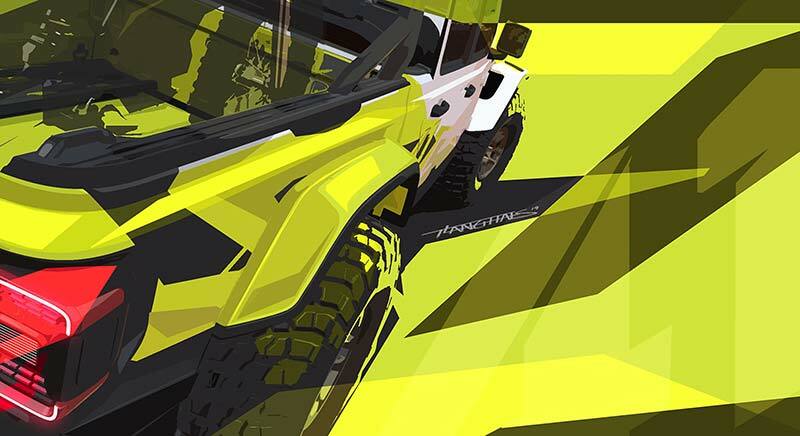 Dynatrac Pro-Rock 60 front and rear axles are featured, as are an Off-Road Evolution custom four-inch lift kit. 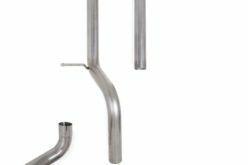 The Flatbill boasts large rear bypass shocks along with 20-in. wheels fitted with 40-in. tires while the inside features bright, bed-lined floors plus custom-trimmed seats to create a sporty appearance. Under the hood of the Flatbill concept will be the 3.6L Pentastar V6 with the 8-speed auto. 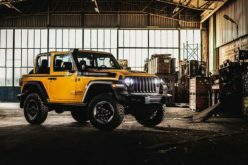 The Jeep M-715 Five-Quarter is a seamless blend of vintage and modern components and uses the term ‘Five-Quarter’ as a historical nod to Jeep trucks of the past that were one-and-one-quarter tons or five-quarters. 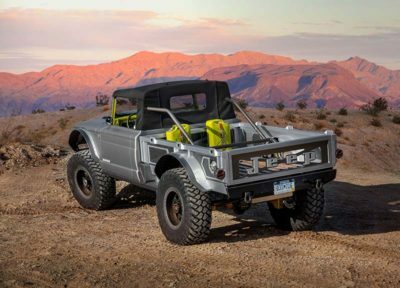 The concept started with a 1968 M-715 and features the original front sheet metal removed with a full carbon fiber front end taking its place. The Gladiator-based military vehicle features a new bobbed 6-foot custom-fabricated aluminum bed that has been perforated and re-imaged using a mix of water jet cut panels and wood slats. 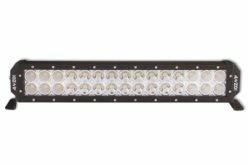 The headlights have been replaced with new HID lights with LED auxiliary lights while rearward LED halo lights have also been installed in the original taillight buckets. The off-road capability of the M-175 Five-Quarter’s has been enhanced by reinforcing the original frame and replacing the leaf springs with a heavy-duty link/coil suspension system. The front axle has been pulled forward two-inches and replaced with a Dynatrac Pro-rock 60 front axle and Dynatra Pro-rock 80 axle in the rear. 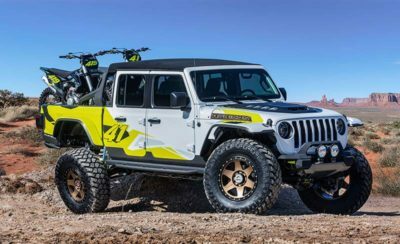 The concept features 40-in off-road tires and a 6.2L supercharged Hellcrate HEMI V8 engine that produces more than 700 horsepower. 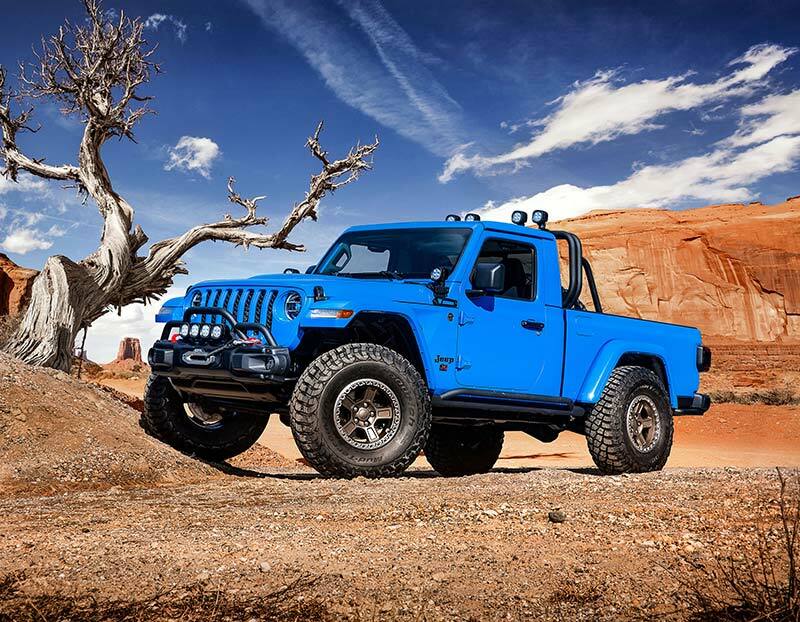 The Jeep J6 concept mixes the classic Jeep truck styling of the late 1970s with prototype and production Jeep Performance Parts from Mopar. 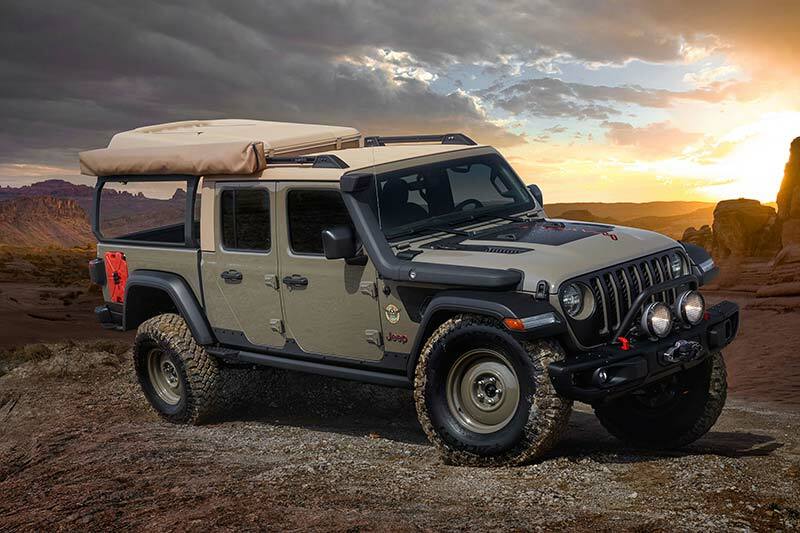 The J6 is a Rubicon that has a customized two-door configuration which maximizes cargo space with a large, six-foot bed that is 12-inches longer than the standard Gladiator bed. The updsized bed area is guarded by a prototype body-colour matching spray0in bedliner and a sturdy, two-and-a-quarter-inch steel prototype sport/roll bar that features LED lights. Prototype 17-in. beadlock wheels are featured with a deep dish design and are wrapped with aggressive 37-in. tires. 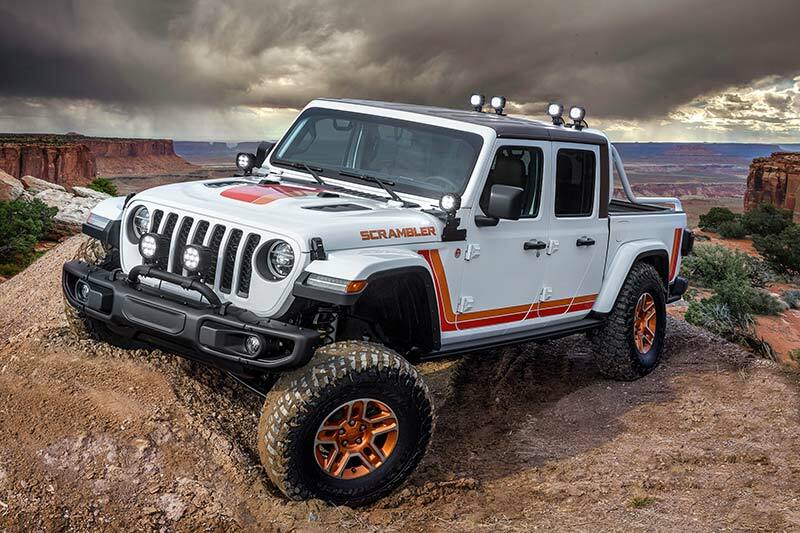 Other modifications for the J6 concept are a prototype two-inch steel stinger bar that bolts to the front bumper and rock rails that hare customized with two-inch steel tubes welded to the standard Gladiator wheels. 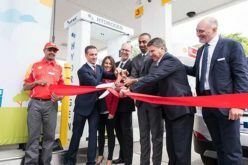 Under the hood is the 3.6L Pentastar while inside features instrument panel inserts that match the body colour and Katzkin leather seats and armrests to name a few. 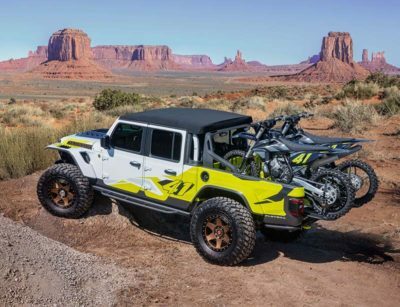 Next is the Jeep JT Scrambler concept which is a heritage-inspired remix and carries the throwback colour palette and graphics of the iconic CJ Scrambler crossed with a combination of new parts. The bed are is customized with a spray-in bedliner and a two-inch steel, prototype tube sport/roll bar that is painted body-colour white. 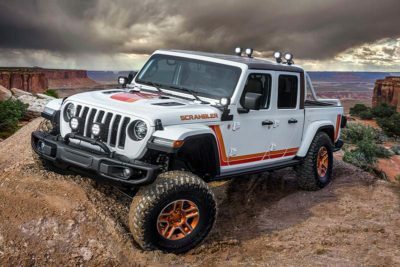 The truck is based off of the Jeep Gladiator Rubicon and uses many Mopar parts including four, five-inch LED lights sitting atop the sport/roll bar and two on the A-pillars. 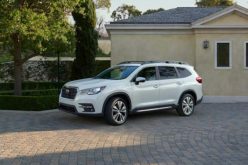 17-inch slot wheels are customized in a concept bronze to tie in with the exterior colour theme while a two-inch lift kit helps clear room for the large, 37-in. 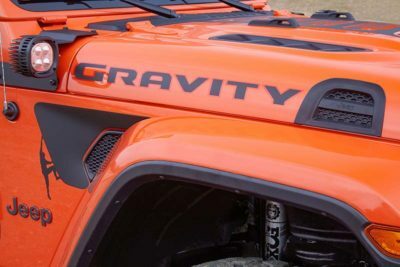 tires and tough rock rails feature a non-slip grip. 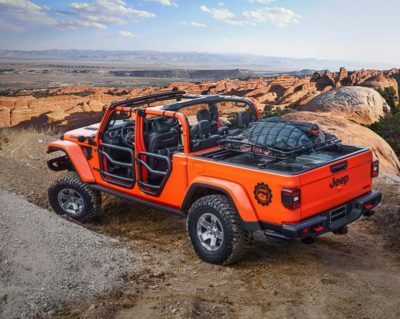 Under the hood is the trusty 3.6L Pentastar V6 and inside features the same Scrambler colour theme with Katzkin Amaretto Brown leather seats bordered in orange thread with the Jeep grille logo embroidered in a light Tungsten on the seat backs. 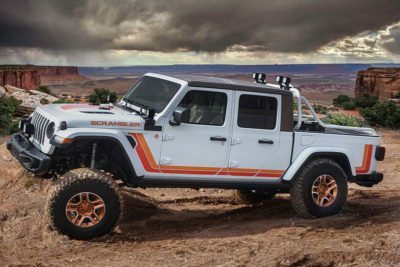 Last but not least, is the Jeep Gladiator Gravity concept that boasts a Punk’N Metallic Orange colour to grab attention. The bed area features Mopar cross rails that work with a cargo carrier basket to deliver storage space for rock-climbing gear such as ropes, helmets or shoes. The rock-climber themed concept provides open-air potential with two-inch round steel tube doors and a mesh sunbonnet that provides cover while keeping the top-down feel and tie-down straps that secure the windshield when lowered. 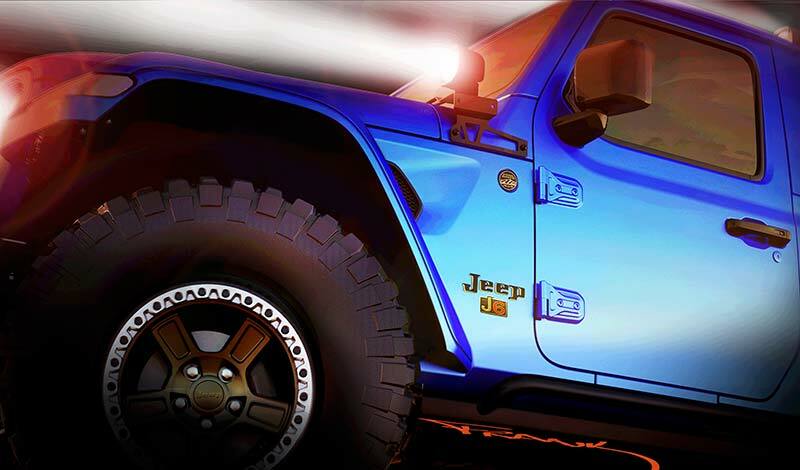 A two-inch lift kit is features and sits on 17-in. 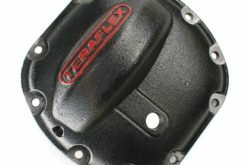 gear wheels with 35-in. 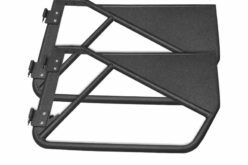 tires while heavy-gauge steel rock rails are thicker and wider and utilize the same powder-coating on Ram Truck bed liners to provide a non-slip finish. 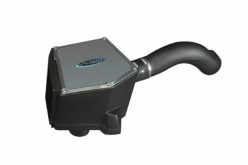 The truck features a cold-air intake and cat-back exhaust system to enhance horsepower and torque while the interior features additional Mopar accessories including grab handles, MOLLE bags and all-weather floor mats.